Created this page, and added downloadable demo! Ah Megaman, one of the best platformers ever made! 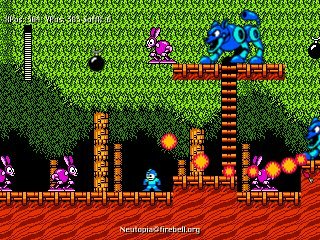 I can't think of a better way to learn to make a platformer engine than to attempt to recreate a Megaman game. 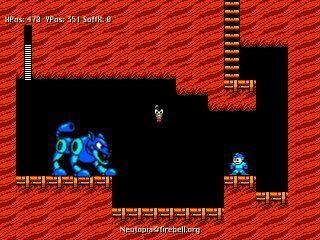 Originally I was just trying to code in a slopes engine but it just kinda turned into a Megaman thing on its own. The slope code is still in there but as you know there weren't any in the early Megaman games so it is not utilized at all. The game engine borrows heavily from Dream Saga. Infact because of this it took less than one week to make. Programming the enemy A.I. code was the most interesting part of this project. It was supposed to be Woodman's stage, but it is still unfinished (for now) until I can put in the boss of course. Do you have any great ideas for this game? All questions or comments are welcome!